Halo 5 is a little over a month away, but if you simply can't wait to see what the game's four player co-op campaign has to offer, there's a low quality shaky cam leak that shows off Master Chief's side of the campaign for the first time. To date, we've only been gifted with Spartan Locke's view of the action. Here's a brief spoiler free version of what's on display, but be warned, there is a MAJOR reveal at the end of the video that fans of the series might not want to know. 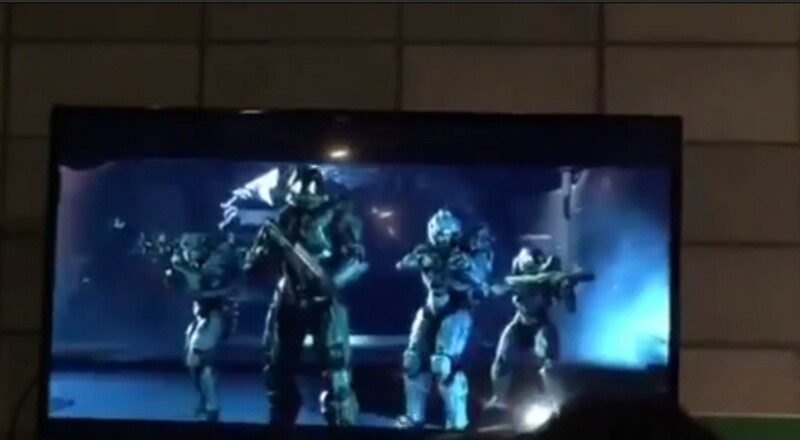 The video starts with Chief and three other companions busting through into a Covenant base. Despite the low quality video it's easy to the see the Halo 5 engine looks really impressive, especially in the lighting department. Over the next few minutes there are various firefights that take place in ship interiors, hangar bays, and control rooms. The level design looks really improved, with wide areas and multiple heights and vantage points to combat the enemies from. You can see that movement plays a big part in the design and gameplay, several times the player jumps and climbs around to get into a flanking or height advantage position. With three other teammates by your said, whether AI controlled or human, the combat seems incredibly intense. If you're playing single player you can see how you can order the AI to use certain weapons or hold different positions for tactical advantage. Speaking of weapons - that new shotgun looks pretty badass, eh? It also looks like players can revive each other in co-op play. No more waiting for combat to die down to respawn. Finally there are plenty of opportunities where the multiplayer spartan abilities make the jump into the campaign, particularly with the ground pound. Combined with the various heights in the maps and there's some truly impressive combat happening. You can watch the whole leaked Halo 5 video right here for now, but be warned, there are some spoilers.